Hazard Scout has built-in lists such as employees, equipment, field-offices, lines-of-business, and customers. At some point, there may be additional lists that you need to keep track of such as "Regions", "Buildings", "Shifts", etc. These are called data lists. For example, you may have a few reports where the employee selects a "Region". You could embed your list of regions directly within the report, but if you ever need to add a "Region" then you'll have to add it on every single field in every single report. A custom data list would be a great fit here. 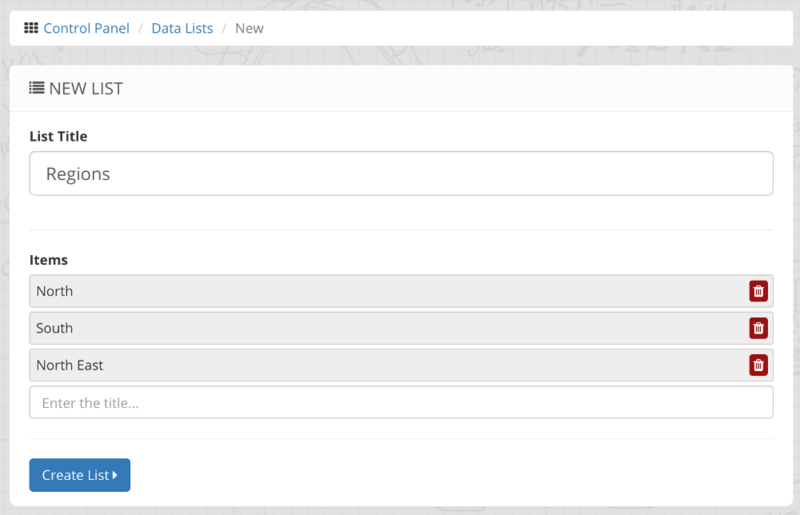 Click "Control Panel" > "Data Lists" > "+ Add List"
Enter a title for your list. e.g. "Regions"
Now list all of your items (aka regions). Press [ENTER] to add additional items. e.g. "North", "South", and "North East"
If you have a large number of items in your list (or if it changes often) then you could use the DataListItem dataload to automatically keep your data lists up to date.